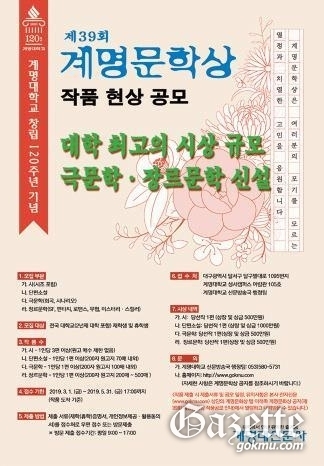 Keimyung University will offer the "39th Keimyung Literary Award" to commemorate the 120th anniversary of its foundation. Participants in the contest include students from universities across Korea, including two-year universities and students currently on leave. Applications for the public offering will be accepted by mail until Friday, May 31 and can be submitted in person by the administration team in Aram Hall . The related public information can be found at Keimyung University's integrated news portal (www.gokmu.com) and inquiries can be made at the KMU Newspaper and Broadcasting System (053-580-5731). The award-winning literary work will be announced in August after screening the received works.